See the Events Calendar for public tours, classes, volunteer opportunities. Read Naturalists' Notes from past Sunday tours. Tour guides and educators teach visitors of all ages about ecological restoration and living in harmony with the land. Public walks offer a basic introduction to the Arboretum. Expect some identification of plants and animals as well as brief scientific explanations of ecological concepts. Free walks take place every Sunday at 1 p.m., as well as one evening walk each month. See our events calendar for details. Expert-led tours of Longenecker Horticultural Gardens and the Native Plant Garden take place on selected dates from April through October, Wednesday evenings from 7 p.m. until dark or Saturday afternoons from 1 to 3 p.m. For more information, see our garden tours page. Twice a month we offer family-friendly programs that explore animals, plants, and natural phenomena through hikes, stories, crafts, and activities. These programs are free thanks to support from the Friends of the Arboretum. Meet at the Visitor Center. On the second Sunday of every month we offer a one-hour Family Walk, from 1:30 to 2:30 p.m., with topics that appeal to youngsters. In addition, the Arboretum Family Nature Programs are held once during most months on a Sunday from 1:30 to 3:30. They combine a naturalist-led tour outdoors at 1:30, followed by drop-in activities starting at 2:30 in the Visitor Center. See our events calendar for upcoming family tours. The Family Nature Program also provides birding backpacks that can be checked out any time, at no charge, from the Visitor Center. Trained naturalist-educators will guide your group through restored prairies, woodlands, and wetlands, pointing out seasonal highlights and describing the ecosystems, restoration, and stewardship. We offer guided private tours for school and youth groups, scout groups, adult groups such as garden clubs, service organizations, and others. Tours can be tailored to curricula and special interests. Please note, we cannot guarantee your tour request until guides are assigned. We will work hard to meet your needs and confirm as soon as possible. We need at least two weeks before the requested tour date to schedule the guides. The cost is $42 per guide per 1.5-hours. Shorter tours may be requested. 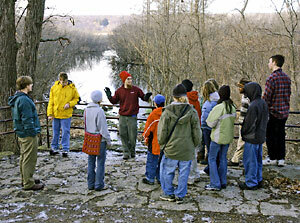 You can request a tour online, or contact the Tour Coordinator at (608) 265-5872 or tours@arboretum.wisc.edu. Thank you for considering a tour at the Arboretum. We hope to hear from you soon.